Playing a team-high 40 minutes, the 24-year-old went off for 33 points, topping his career-high point total for the sixth time this season. Jeremy Lin — who signed with the Raptors Wednesday after being waived by the Hawks — played 17 minutes off the bench for Atlanta that night. Siakam, who went 15-of-25 from the field in scoring those 44 against the Washington Wizards Wednesday, is stretching the parameters of what a breakout season can be. He’d broken out when he scored north of 20 in three consecutive games early in the year; when he had double-doubles in six of 10 games through the season’s middle; when he set a career high in points again and again and again, doing it a seventh time Wednesday. Jabari Parker and Bobby Portis were both acquired by the Wizards at the trade deadline and they did what they could to keep their team in the game. Parker bounced back from scoring zero points in his last game with Washington by dropping 22 points off the bench tonight. He also had nine rebounds and four assists in his 34 minutes of playing time. As for Portis, he scored 12 points to go with six boards, an assist, steal and block in 29 minutes off the bench. Aside from Parker and Portis, their bench scored one point from Wesley Johnson. The Wizards depth has been an issue this whole season and the addition of these two off the bench kept things competitive tonight. Portis has been awesome since the move to Washington averaging 18.5 points and 7.3 rebounds per game. He’s reached double-figures in scoring in every contest. Parker has posted 12.3 points per game since joining the Wizards but the most eye-opening stat is his assists – he’s averaging 5.3 assists per game, more than double his career average. Tonight’s win was the Raptors’ sixth consecutive victory, the longest current win streak in the NBA. The reigning NBA Champion Golden State Warriors could tie that streak with a win tonight, but regardless Toronto is one of the hottest teams in the league headed into the All-Star break. They boast the third best record in the league at 43-16 just one game behind the first place Milwaukee Bucks. The break is timely giving Fred VanVleet a chance to get healthy while also giving Gasol and Lin some time to get accustomed to their new home. The Raptors have to feel very good about where they are at this point in the season. The contrast was fitting, in a way. 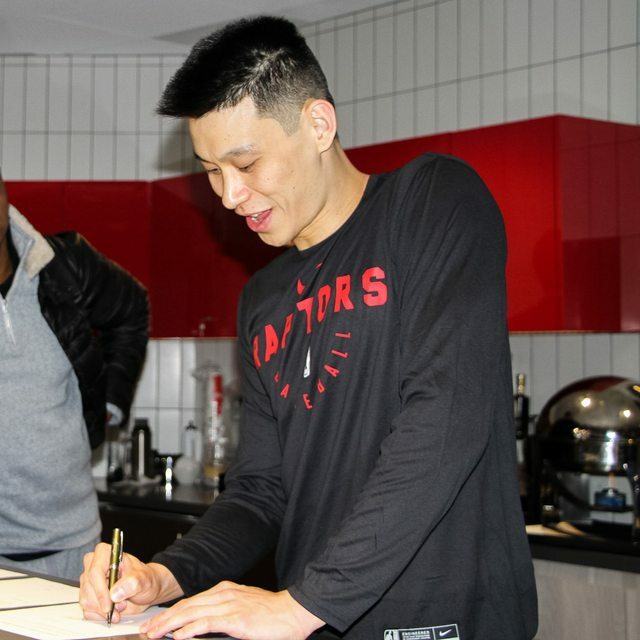 Seven years ago almost to the minute, Jeremy Lin was the focal point of one of the most magical nights of basketball in Raptors history. Sure it came in a loss, but let’s face it, the Raptors’ 2011-12 season was lost before it started. But on Valentine’s Day 2012, Lin’s moonshot from undrafted, twice waived, couch surfing bench-warmer to the cover of both Sports Illustrated and Time Magazine peaked when he hit a game-deciding triple over then-Raptors guard Jose Calderon in front of a delirious crowd at the then-Air Canada Centre. 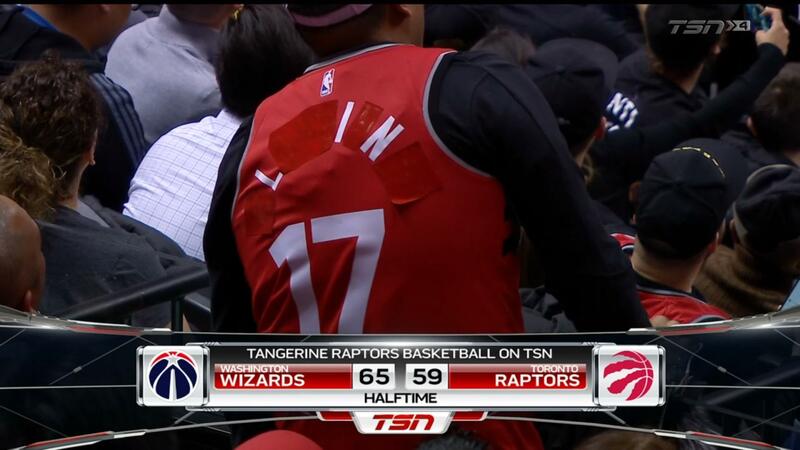 “Lin for the Win” was Raptors play-by-play voice Matt Devlin’s spot-on, spontaneous call. The crowd – packed with Lin fans who paid top dollar for tickets on the secondary market to see their personal comet – went crazy. “I like us and I think there’s still a lot of room for improvement,” said coach Nick Nurse. “I feel like we play really really well at times. I think there’s times when we don’t play so well but it doesn’t seem to bother us that much. We get down eight or 10, 12 (and) we seem to get back in it quickly sometimes. Close games, I think, we seem pretty calm. After a disjointed opening half, the Raptors finally got their act together and, led by a career-high 44 points by whirling-dervish big man Pascal Siakam, were able to subdue the Wizards 129-120, Toronto’s sixth consecutive victory. Siakam also contributed 10 rebounds. OG Anunoby was also a bright spot for the Raptors, contributing 22 points, also a career best. The Raptors trailed by as many as 12 points in the third quarter – 80-68 with just under nine minutes left after a fast-break dunk by Thomas Bryant. That seemed to light a fire under the behind of Lowry, who helped engineer a big comeback, eventually hitting a three-ball that lifted Toronto back in front 81-80. Lowry then threaded a great running bounce pass to Danny Green in full stride with Green making a nice finish at the basket and Toronto would go on to secure a 103-93 for the fourth quarter. Washington kept things tight in the fourth but a late flurry ignited by another three from Lowry, who finished with 14 points and 13 assists, sank the hopes of the Wizards. A sky-scraping three by Green with just under two minutes left was the icing on the cake. A native of Torrance, Calif., Lin became the first U.S.-born American of Taiwanese descent to play in the NBA, signing as an undrafted free agent with Golden State in 2010 after attending Harvard University. “Kawhi’s a grown man, he’s going to decide what he wants to do, but I believe just from getting to know Kawhi very, very well that he will make the right decision,” Ujiri said. Getting to have Leonard on the team for a year is better than a one-hour presentation if they were pursuing him in free agency, Ujiri said. He said Toronto is going to do everything they can to show Leonard it’s the right organization. “He sees who we are and he sees the organization that we are and I think there’s a lot of upside to that,” Ujiri said. Part of this confidence from Ujiri stems from the controversial “load management” the Raptors have allowed Leonard, who has only appeared in 43 of a possible 58 games this season. He was once again given a night off Wednesday against the Washington Wizards. Ujiri said keeping Leonard rested was a key aspect for the Raps when they first acquired the forward. “It was important for us and our plan and our program, and now we’re just executing,” Ujiri said. “This is [Raptors assistant and director of sports science] Alex McKechnie along with other people who have helped us with this whole process. They lost the 6-foot-9 forward in transition, they lost him at the three-point arc, and they lost him under the basket in a 129-120 Raptors win that had home fans chanting “M-V-P” as he shot a pair of free throws in the final minute. By that point, after Siakam posted a career-high 44 points to go with 10 rebounds, it would have been difficult for the Wizards to disagree. Siakam made 15 of 25 shots, the most attempts of any player on the floor, and made four of his five three-point attempts. On Sunday, Beal will play in his second straight All-Star Game, and Coach Scott Brooks can envision Siakam earning the same honor next year. “He keeps playing like this, he’s a 2020 all-star,” Brooks said. Although Beal (28 points), Jeff Green (23) and Jabari Parker (22) formed a strong offensive trio, Washington (24-34) will enter the all-star break with regrets after another shaky defensive performance. Toronto’s 16 three-pointers powered its comeback from a 12-point deficit. Besides Siakam, OG Anunoby (career-high 22 points) and Kyle Lowry each made four three-pointers. One month earlier, the teams met in Washington for a wild and entertaining matchup that saw Beal score 43 points for his second career triple-double. Kawhi Leonard shined as well in that game, scoring 41 in Toronto’s 140-138 double-overtime win. Much has changed in the past 30 days. The NBA trade deadline and buyout market rearranged both rosters. Leonard sat out Wednesday’s game with left knee soreness, and five players who were on different teams during that January meeting appeared on the court for early rotation minutes. When the Raptors acquired Leonard last summer, it seemed like a big win for Toronto that they did not have to give up the services of Siakam, a 6-foot-9 forward with a 7-foot-3 wingspan. The 24-year old dropped a career-high 44 points on 15-of-25 shooting including 4-of-5 from deep where he is only a 32.3 percent shooter for the season. He also added 10 rebounds and was a game-high +24 in point differential. Arguably the Raptors’ third best player (if that) had more than the Wizards’ starting forward of Trevor Ariza and Jeff Green combined. Why did Lin choose Toronto? He says the Raptors "really, really" wanted him, and that spoke volumes, nice to be wanted. "That means something." He also mentioned the opportunity to win and to play.